For the first time ever, I dog-sat last weekend. People, don’t start getting excited and planning to board your dogs at “Camp Ragfield”: this is not something I plan to do regularly, as I emphatically maintain that I am not a dog person. But I do make exception for one 8-pound mini-pinscher/Chihuahua named Ravage who belongs to my friend Derek. The whole thing went pretty well: no mishaps. Ravage was as good as gold the whole time. He is a perfect lap dog, so whenever I was sitting, he would invariably curl up on my lap to cuddle with me. Ravage also has an expansive repertoire of tricks. At one point he even began doing his tricks unprompted, which I found hilarious. I assume he had a craving for a T-R-E-A-T and thought I would give him one if he performed all of his tricks for me. (His strategy worked). 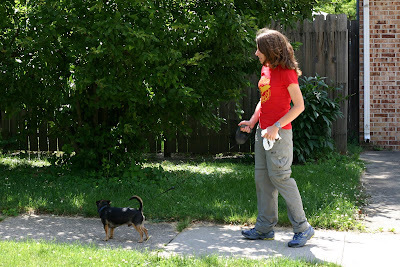 Melissa and Ravage on the way to the park. 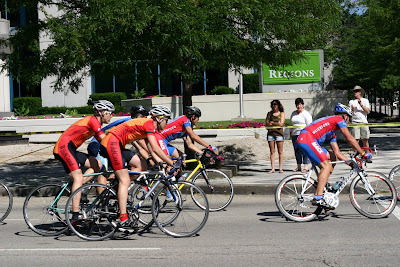 Rob also did a bike race this weekend. 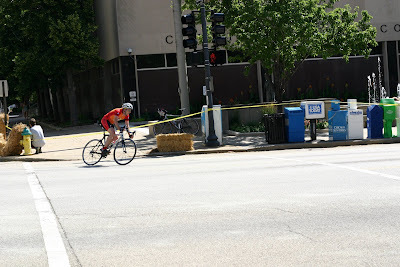 It was a “crit” or criterium race. 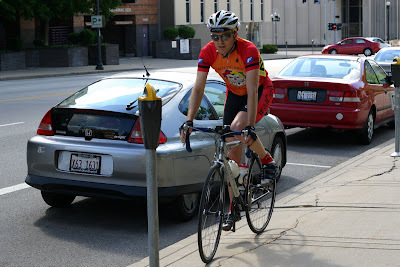 On his blog, Rob said this was his least favorite kind of bike race, and it is my least favorite kind of bike race for him to do. These races are typically a 1 mile loop that is repeated for a zillion laps at extremely high speeds. With 40 or so riders zooming around tight corners at a million miles an hour, this is a recipe for disaster indeed. Thankfully Rob managed to stay upright this time (he’s crashed at crits before), but he had a difficult race despite the air-tight strategy of Team Wildcard (his cycling team). Early on in the race, a rider directly in front of Rob had a tire pop and then crashed. Rob stayed on his bike, but he had to come to a screeching halt and ended up getting separated from the lead pack. He really did make a heroic effort to bridge back to the fast group, but he just couldn’t do it on his own. He passed everybody that had gotten cut off from the lead group as a result of the crash, and he ended up totally by himself for the remainder of the race. I felt really terrible for him because I knew how hard it must be, to be completely on your own without anybody to work with you, in a race as tough as this. On the bright side, however, all those tight corners were a lot safer when he was by himself instead of pack of other cyclists. Unfortunately, the race officials made a mistake in the final results and placed Rob much farther down in the standings than he belonged. When we finally got to talk to a race official about this, I was just this side of ripping off her head, but Rob very calmly and diplomatically explained the mistake that had been made. The race officials did in fact agree that a mistake had been made, and they (eventually) corrected the error. Oh well, better luck next time I guess. One more thing: the baby cardinals are gone. The nest is completely empty. I had a very bad feeling about this, but then I checked a website that my vet friend Dr. C sent to me, and it says that cardinals fledge in 9 to 11 days. The first I noticed the babies was June 22, and the birds disappeared by June 29… I am hoping that they had hatched a couple days earlier and now they’ve gone on to the big, big world, but I guess I’ll never really know for sure. Thanks for reading. I'm sure the baby birds are doing just fine, wherever they are. Did you let Ravage sleep with you? When we have dog-sat for him before, I have absolutely loved how he burrows into my side or my legs while sleeping.